Far more than just a neophyte’s easy-to-keep/easy-to-breed livebearer, members of the genus Xiphophorus are some the most exciting, even some of the sexiest, New World tropical fishes being kept in aquariums today. • Amazing New Strains: Hans-Georg Evers, Tobias Bernsee, Rainer Schultz reveal a portfolio of amazing swordtail color varieties and unusual morphs with award-winning finnage and rare color combinations. • Nano Swords: Unknown to most aquarists, Xiphophorus pygmaeus is a delightful dwarf swordtail in several color varieties that live in shoals and make fascinating subjects for smaller aquariums. • Whether we keep them or not (most of us won’t), all aquarists have a fascination with one of the world’s most feared fish. Expert Wolfgang Staeck profiles the available species with their behaviors, biology and propensity to bite. • One of the most popular and influential online personalities and aquarium authorities, Julian “Jools” Dignall is the brains and energy behind Planet Catfish. AMAZONAS Editor Hans-Georg Evers gets a rare invitation to tour the personal fishroom of an aquarium legend to see what he is keeping and breeding. • Dr. Paul V. Loiselle offers rare insights and an authoritative guide to some of the perenially most-popular aquarium fish of all: the Banded Barbs in the genus Puntius. • Take a walk into the rainforest streams of Borneo in search of a highly diverse genus of aquatic plants that are among the most-coveted species among planted-tank enthusiasts today. • Hans-Georg Evers goes in search of the thrillingly hued and ultra-rare Ajamaru Lakes Rainbowfish, Melanotaenia ajamaruensis, in a must-read story for all rainbowfish fans. 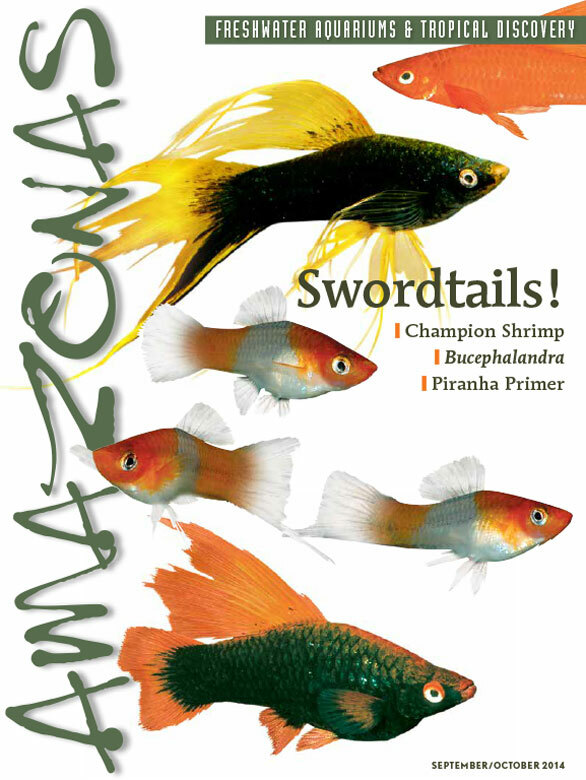 And more: Look to the next issue of AMAZONAS for fresh inspiration, new ideas and a cover-to-cover celebration of the joys of aquaristics.